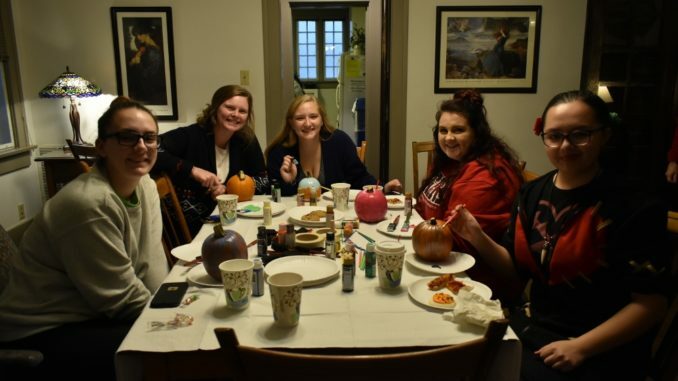 Wittenberg has held a variety of Halloween events the last few weeks, among them the Honors Department’s “Not-So-Scary Halloween Gathering”. Hosted at the Matthies House, the gathering was a warm haven on the chilly, rainy Friday night. From 4:30 to 6:30 students could come paint pumpkins, enjoy cookies and fresh – not made from powder – apple cider, and socialize. Costumes were optional, so there was a mix of students in fun costumes and students who just wanted to enjoy the cozy Halloween atmosphere the house provided. The Honors Department Assistant, Beth Hallauer, was pleased at the turnout of students this year. The new Honors director, Molly Wood, was not present at the event and, due to the hectic transition to her new role, there was little time to plan events for the Honors program. The event was beat-for-beat the same as last year, with the same date, posters, and events. It is hoped that as the Honors department will soon be able to push forward with new and fun events like the Halloween Gathering.